Libraries Quietly Struggle With Mayor’s Proposed Budget | News and Features | Style Weekly - Richmond, VA local news, arts, and events. 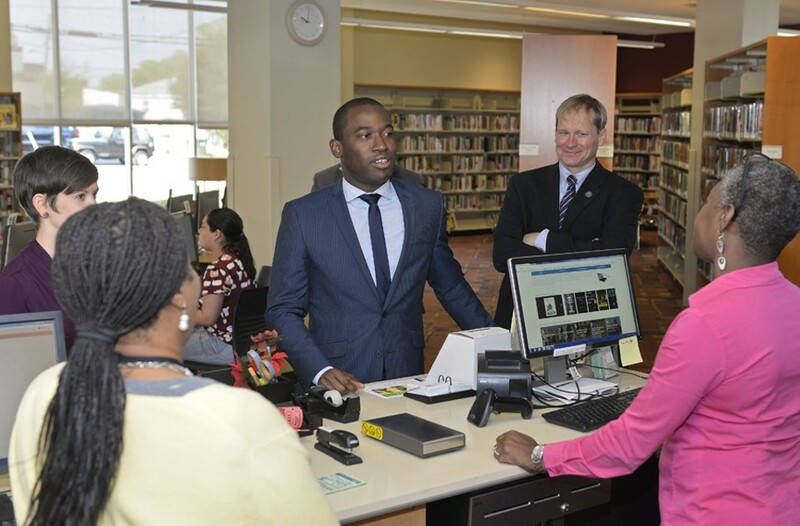 Ash Daniel Mayor Levar Stoney visits the East End branch with Richmond Public Library director Scott Firestine on Thursday as part of National Library Week. The East End branch of the Richmond Public Library system was bustling Thursday morning. And most patrons weren’t there for Mayor Levar Stoney’s planned visit. Chloe Rote, who lives a few blocks away, came to pick up requested books. But she says it’s the atmosphere that brings her here too. At the computers, a teenager who’s 15 years and 7 months old, as she describes herself to the mayor, is applying for a job at Kings Dominion. Others are using laptops for the free wireless Internet or reading periodicals to keep up on news. Stoney’s proposed budget for fiscal year 2018 continues a downward creep in library funding. Since 2015, the libraries’ budget has decreased from $5.5 million to $5.2 million. Coupled with a rising Richmond population, the proposed $5.28 million figure would put per capita library spending at its lowest in years. Stoney is eager to show support at the East End branch Thursday. With library director Scott Firestine and branch manager Tara Franzetti in tow, the mayor leads a toddler through his ABCs and gets behind the counter to meet staff. Perhaps more so than other public events, people approach the mayor with ideas and feedback at the libraries. One patron who comes daily suggests some picnic tables outside, because eating inside isn’t allowed. Yusef Suggs has come to discuss gentrification in the neighborhood and introduce his middle-school-aged son to Stoney. The boy asks the mayor about his entry into public service. Stoney replies that he had an early interest in leadership and government. For branch manager Franzetti, it isn’t surprising that a library setting makes the mayor more approachable. They’re a safe space, she says, and people are respectful of them. Franzetti makes sure the mayor meets the many regular patrons at the branch Thursday morning. In presenting his budget to City Council on Monday, Firestine was matter-of-fact about the effects of the cuts. The $210,756 decrease would come out of part-time salaries and operating expenses. With the re-opening of the renovated West End branch in August, the 72 full-time employees of the libraries would be spread even thinner among nine open branches. “So we need to get that funding back because in August we’ll be operating nine libraries with a staff of eight [each],” he said. Without it, hours would need to be cut, potentially the popular Sunday hours at the Broad Rock branch -- the only library in Richmond or nearby Chesterfield County that’s open Sundays. Or the opening of the West End branch might have to be delayed, Firestine said. Meanwhile, library board chairwoman Gail Zwirner says that extending hours is the No. 1 ask from the public. Chesterfield libraries stay open until 9 p.m. on weekdays. And that’s not to mention the kinds of amenities found at two stunning, high-tech libraries recently built in Henrico County. City Council President Chris Hilbert has proposed an amendment to restore library funding to the current year’s amount, and Stoney says he supports it. This was news to Firestine on Monday, but he welcomes it. “When you have vacancies and they take a snapshot of your database, that money can be at risk or taken away,” he says. The renovations of the last few years have allowed the libraries to run fewer branches with the people they had. Now they need 83 employees. But unlike police and fire departments, or the school board, he’s not at City Council to ask for more. Like the stereotype of a librarian, Firestine doesn’t want to make a fuss or fuel a budget showdown. Libraries serve hundreds of thousands of people a year -- 517,920 since last July, according to the library board report. In addition to book access, the libraries provide Internet and computers, a free notary service, printer services, computer and adult literacy classes, children’s events and more. In front of the mayor on Thursday, Firestine is keen to understand. Hilbert’s amendment has support from other council members, Zwirner says, and the board members are crossing their fingers. But other council members will offer amendments starting Monday as well, and increases will have to come with cuts elsewhere. Hilbert didn’t respond to a question about what he proposes to cut to make up for the increased library funding.